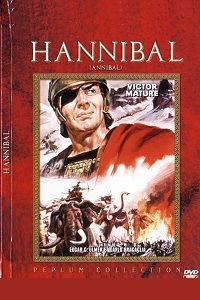 The Siege of Syracuse movie (L'assedio di Siracusa) is a 1960 Italian production and the story of the Roman Siege of Syracuse which happened during the Second Punic War between 214 and 212 B.C.. The movie was shot in Italy. Sicily had always been a strategic location for both the Romans and the Carthaginians. 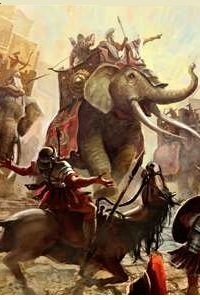 The Romans had taken over the Greek city of Syracuse and the entire Sicily island by the end of the Second Punic War. 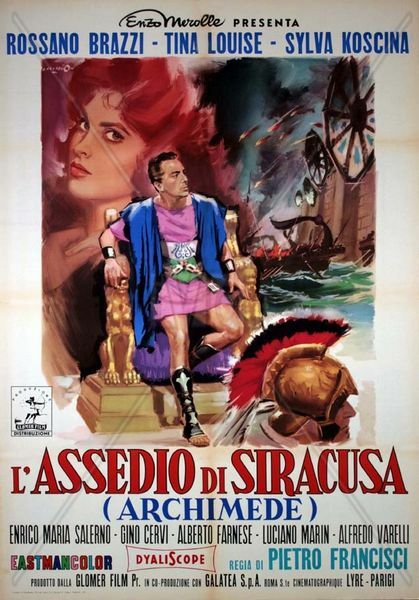 The movie shows Archimedes (Rossano Brazzi) known in history for his various inventions. Actually if you ever travel to Sicily and especially to Syracuse, you will see many shops and products bearing the name of Archimedes. In the movie, Archimedes invents what looks like a satellite dish that reflects sun rays and produces a powerful light beam, powerful enough to burn the Roman fleet. Archimedes was to be married to Clio (Sylva Koscina) the daughter of King Hieron. But he abandons her in favor of Diana (Tina Louise) a beautiful exotic dancer whose brother Gorgia is a spy for the Romans. Mirrors were probably used during the Siege Of Syracuse but it is unclear whether they were used to burn enemy ships or to blind and dazzle enemy crews. It is worth noting that the 2nd century Roman author Lucian wrote that during the Siege of Syracuse, Archimedes used a weapon, sometimes called the "Archimedes heat ray", to destroy Roman enemy ships with fire. Centuries later, Anthemius of Tralles mentions "burning-glasses" used to focus sunlight and burn enemy ships. In 1973, a Greek scientist by the name of Ioannis Sakkas conducted an experiment to test the Archimedes heat ray. The experiment took place at the Skaramagas naval base outside of Athens where 70 mirrors (1.5 by 1m) were used to focus the sunlight. The mirrors were made of a copper coating using only the technology available back in the 3rd century B.C.. When the mirrors were focused accurately they were able to burn almost instantly a plywood ship at a distance of 50m (160 ft). It is worth mentioning that the ship had a coating of tar paint which was commonly used in the classical era and which aided combustion. Other similar experiments were later conducted by MIT. Overall, an entertaining movie about the Siege of Syracuse that also tells the story of the Archimedes heat ray. If nothing else, the movie is worth watching for its beautiful shots of Sicily.